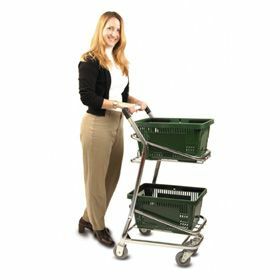 Bridges the gap between hand baskets and regular carts. Helps increase average ticket dollars by keeping hand basket shoppers in store longer and increasing their basket capacity. Purse or bag hook allows for maximized basket use. Can be used with or without baskets. Supports up to 200 lbs. Rolls on 4" non-marking wheels with steel roller bearings. Measures 22"L. x 12.75"W. x 41.25"H. Available in Green, Red, Black and Metallic Gray finishes - please specify color. Ships UPS. FOB Shipping Point.